I’m sure most of you are like “huh?” You’ve never heard of kefir…..and I hadn’t either, until two of my friends told me about it. They were both using it and hailed the benefits of it. I shook it off myself, thinking, “nah, this is not for me.” I was wrong! I was sick a little last year, and I had to take antibiotics. If you know anything about antibiotics, you know that they are hard on your stomach. I had problems with them, and my friend told me that I needed to eat lots of probiotics – she was right. Once I upped my probiotics, I got better fast. 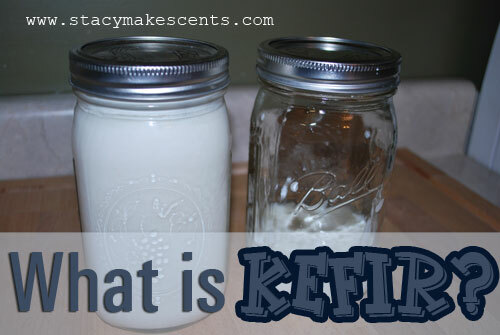 Now I’m making kefir every day…….do I have your attention now?What is kefir? Basically, it’s fermented milk. That sounds pretty nasty, right? When I was told what it was, my first thought was “Ew!” Kefir tastes somewhat like buttermilk. It can be used as a substitute for buttermilk, plain yogurt, or sour cream. It’s chocked full of probiotics – it’s really, really good for you. It’s full of vitamins, minerals, and it is very easy to digest since it’s already partially broken down. It will keep yeast infections at bay…..sorry guys. Pretend you didn’t hear that. Some people who are lactose intolerant are able to drink kefir without a problem. There are TONS and TONS of health benefits. Go here to Dom’s Kefir Site to read them all. 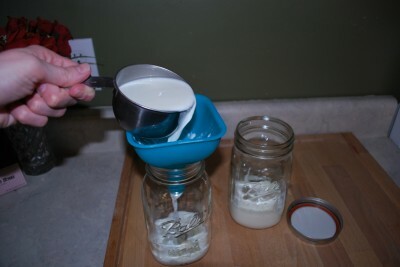 You can buy kefir at the store, usually in the health food section, or you can make your own. I am making my own, so let me show you how. It is very cheap to make once you get started. 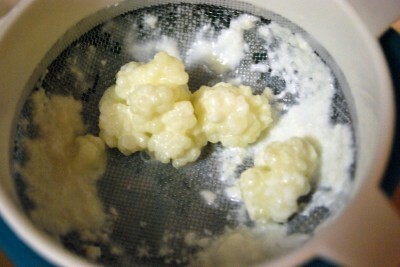 These are kefir grains. They look like cauliflower and they feel really funny. I had to touch it……I just couldn’t help myself. You’ll make your kefir from this. I got mine from a friend. Hers had grown, so she had extra to share. You’ll start with about a tablespoon and they will grow……so you can make a bunch of kefir, or share your grains with friends. There are bunches of places to buy them. You can purchase them on Etsy if you like. 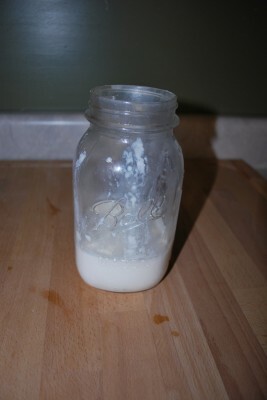 A really good kefir resource site is Tammy’s Recipes. Here is her linkwhere she tells you where to purchase your grains. She has an excellent site, so visit it sometime when you have a minute to spare. Make sure you buy grains and not a starter. A starter can only be used a few times, while grains can be used as long as you like.Be nice to me and I might give you my extras. Ha, ha! You’ll need a quart-sized jar, or larger depending on how much you’re making. Put your grains in the bottom. For every tablespoon of grains that you have, you’re going to add one cup of milk. It needs to be mammal milk….if you use soy or any type like that, your grains won’t keep producing. You can use any percent. I use whole milk. You’ll place a lid on top….sorta. As you can see, I’m just using the canning lid. I lay it on top. It is going to ferment, therefore there will be gas….and it could explode if the lid is tight. Speaking of lids and gas, have you seen this cool thing with Mentos and Diet Coke? We’ve done it lots of times and it’s REALLY COOL!!!! Yes, and I was forbidden from performing experiments in my high school chemistry class. Wonder why……Oh, and there is a minimal alcohol content in kefir due to the fermenting process. Don’t wig out, it’s just like sourdough bread. 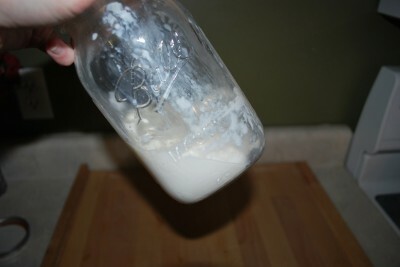 Kefir grains must not come into contact with direct sunlight. It will kill them……MURDER! Think about kefir grains as being akin to vampires. They can be in the light, just not the direct light. So, I sit mine in this corner behind my million utensils. 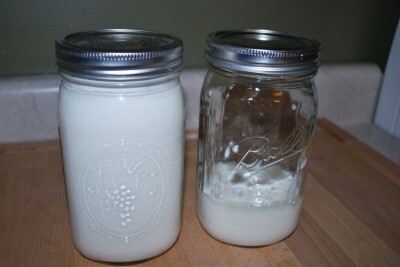 It can take from 12-48 hours for kefir to be ready. It will depend on the temperature and humidity in your house. Mine is done for my liking in about 24 hours. It will become very thick. The longer you let it ferment, the tangier it will become. It will be the consistency of runny sour cream. Turn your jar from side to side to check on the consistency. When you smell it, it will smell soured like buttermilk. 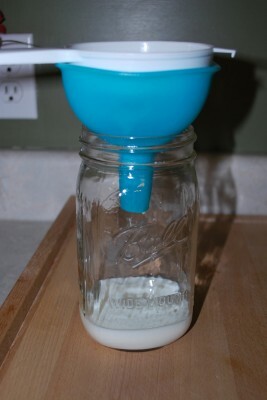 To finish your kefir, you need a funnel, a jar, and a mesh strainer. 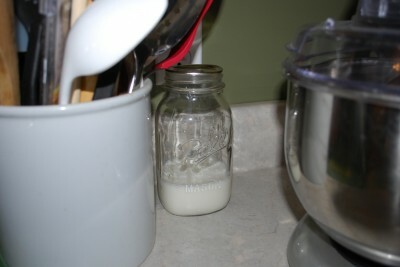 I store my kefir in canning jars in the fridge. Put your funnel in the jar. Mine is large enough that I can put my strainer down in it. 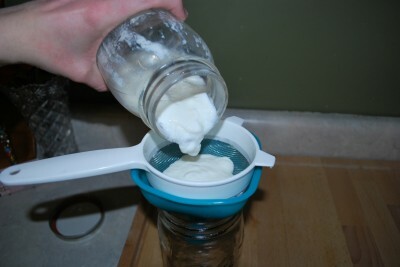 Your finished kefir will fall down into the jar, leaving the grains in the strainer. You can put your grains back down into their jar, add your milk and start over again. I don’t wash my jar every time…..I wash it every few days. Put a lid on your jar and store it in the fridge. It will keep for MONTHS….after all, it is fermented.We’re loving our kefir! Annie goes crazy when she sees me preparing it. Tomorrow I will cover all the different ways that you can use it. There is tons of excitement lurking around every corner here at Humorous Homemaking. Dear Stacy, I am Seval and I’ve been looking for people to share their extra kefir grains. I make my yogurt at home, but since I don’t have kefir grains I can’t start it at home. I buy kefir drink from the store, but I like to make stuff at home, so I am trying to find some kefir grains. I would appreciate it very much if you let me know what I can do to have you share your kefir grains. Thank you and have nice day. Unfortunately no, there isn’t a way for Stacy to share her kefir grains, but they are sold all over the internet (including Amazon!) or at your local health food store. I have made kefir before, but then my grains died during the summer. My mom gave me some new ones recently and I started making it again. 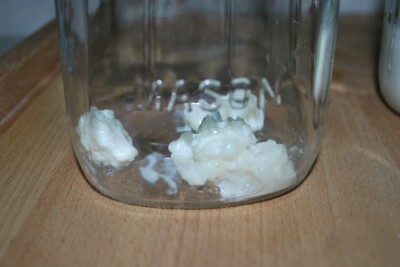 I have two problems though: 1. after the 2nd batch, the kefir started being stringy (kind of like mucus). It tastes great, but I don’t remember it being like this before. 2. I put it strained in the fridge and after 2-3 days it started getting kind of creamy mold on top (like when fresh dairy products get old). I did remove the top and use it, but you mentioned it can keep for months, so I am wondering. Any idea why any of these things are happening? Thanks. Hi Stacy! I’ve made several batches now and the taste is finally getting cleaner (it was gross at the beginning, like wine buttermilk *blech*). I keep hearing different guidelines for amount of grains to use and how long to ferment. Some people say 1 tsp for 2 cups of milk, others like you say 2 Tbsp. This last batch I used 2 Tbsp and by 18 hours it was quite sour. It’s not as thick as I’d like but I can’t leave it with the grains any longer or it’ll get too sour, right? I’m using organic whole milk (pasteurized). My kitchen about the perfect temp I think, esp if I do it overnight so it doesn’t get too much daytime heat. Do I need to use less grains so I can let it ferment longer to get thicker without getting too sour? Thanks in advance!! Also note that if you don’t like using the grains you might like it better to use the “instant” packs that you can buy from Bread Beckers. I think they work up to 8 times each? Hi Stacy, I am very new to all this, but I was curious…. how did you go from 1/4 jar full to a full jar? Are you just adding batches together? It’s thinner than Greek yogurt, but with the same twangy taste. 🙂 You can flavor it however you like! Right now, no…I have three friends in line for them. 🙂 You can check back in a month or so? I’ve used both very successfully. 🙂 I always use whole milk though because it yields a thicker and creamier result. Skim milk get just barely thick. Hi Stacy, thanks for posting this. I love kefir but have only bought it in the store, now with this I feel like I can make it myself at home. I wanted to pass along a website I found while doing more research on this subject – http://www.realmilk.com. Consumers can go there to look up where to buy real, raw dairy products in their state. Thanks for all the great recipes and information that you post – you help me stay grounded! Thanks for sharing that site! I found our raw milk source through my homeschool group. Stacy, again perfect timing for me once again. I’ve have been on antibiotics for months and it needs to stop. Going to buy keifer TODAY, and buy the grains online. Thanks, Stacy. Yes – kefir is great to build up your healthy flora! When you go to pour it into the sieve, BE VERY CAREFUL. It will be very thick like clotted cream at the top and does not “pour”. I had a sudden *glurp* and the top 3 inches fell onto the strainer with the more liquid stuff underneath pouring out very quickly. Big mess. Strainer was over flowing, some grains got past it and were clogging the funnel, so I quickly dumped that and the 2 inches left in the jar into a bowl with a pouring spout to pour gradually, as it IS very thick and is taking its dear sweet time, It had been sitting for about 16 hours. I don’t know how I would “pour” at all if you left it sitting longer! I don’t know if this is because I did a whole full quart jar or if I did something wrong. Please let me know if there’s a mess free way, and also do the thick parts eventually go through the strainer? Perhaps my strainer is too fine? For now I’ll dump the stuff into a bowl first and then start straining. 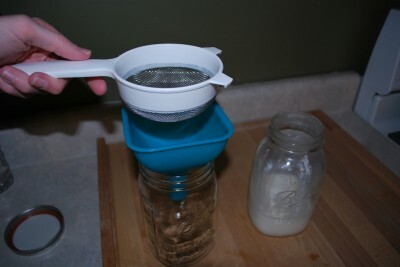 And get a strainer that’s not real fine mesh…..Thanks for the great tutorial on making kefir though! Ha, ha! 🙂 I giggled when I read this. It’s happened to me on multiple occasions, even when I know I should pour slowly. I know the “glurp” sound very well. 😉 I let mine culture for 24 hours so that it will get nice and thick. I only pour out a small amount of kefir at a time and I work with that bunch before moving on. I use a small, mesh strainer and I use a plastic spatula to stir it around in there so that it will go through. Otherwise, it just sits there and lets the whey drip out. I usually don’t make a mess at all now, unless I’m not careful when pouring a bit out. If it’s really thick, you might want to just scoop some into your strainer. We prefer very thick kefir and my mom likes thin…so she doesn’t have this problem. I’ll make a note in this post about pouring slowly and stirring lightly in the strainer to get the thickness to fall through. Thank you for the great comment! I love talking kefir. 🙂 And kefir cream cheese is FABULOUS. Stacy…I’m so distracted by your blog! Ahhh! I should be working! 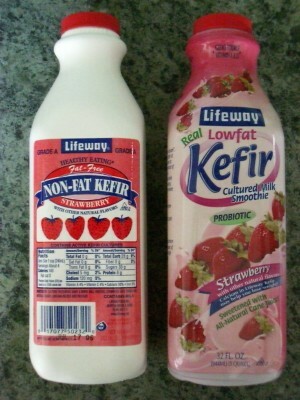 I have bought kefir before from the grocery store, never really knew what it was though! Ha! This sounds AMAZING! Would you be willing to share with me too? I’ve been searching for a realistic blog that can incorporate eating whole…I have found it! You have a reader for as long as you keep doing this! Thank you! Okay…now back to work! LOL I’m sorry! 🙂 Go back to work. Ha! Actually, I gave my grains away when I moved….I couldn’t keep them up when not living in my own home. But, I do have plans to pilfer some again and start growing extras for you guys. So, when you see that I’ve moved and gotten settled, make sure to hit me up again. I’m excited to try this, but I’m curious what you do with the grains when you are not “brewing”. Can they be stored when I have more than enough Kefir in my fridge and don’t want to keep making more? It was starting to thicken. The lid looked like it had sour cream on it, but the rest was pretty runny. I only had raw milk in the house, although we normally use regular milk, so it’s in that. Is warmer or cooler better? It will get thicker faster the warmer it is….and the longer it cultures, the more sour it will be. Please keep me posted! I would check it after 24 hours. Just got my TB in the mail from you … THANKS! Have it in a cup of milk on the counter … will it need a “recovery” period, or will I be good to smoothie make tomorrow do you think? SO excited – thanks! I’m glad! 🙂 It really depends on a lot of things….the temperature mostly. Was the milk thick when it arrived? Got the grains from you and just made a batch (2 cups) and followed your picture instructions! I took pictures too! THANK YOU for sending me them! You “Rock my Face Off”… you’re fav quote back at ya! 🙂 Enjoy! I didn’t measure how much I sent you……..did I send you two tablespoons? It’s usually 1 tablespoon per cup of milk. I’ve done it before. 🙂 It’s less than $5 unless something has changed. No biggie. Just read the tutorial and let me know when you’re ready. I live in Gray, TN. Do you know anywhere local that sells kefir grains? I’ve gotten kefir from Earth Fare and my son liked it. I didn’t see grains of it though at Earth Fare. I cant get enough of your site. Its really a great read. Did you start doing this on your own or with a group of people? Its quite an impressive feat to have gathered such great content. Keep up the fine writing! I can’t find the grains ANYWHERE!!! Help….please….???? By the way, what % milk is best to use? Kefir is so soothing and so versatile. This week I made fish tacos and instead of searching for over-priced crema at the store, I added chipotle peppers to my kefir and drizzled that on. Worked great!